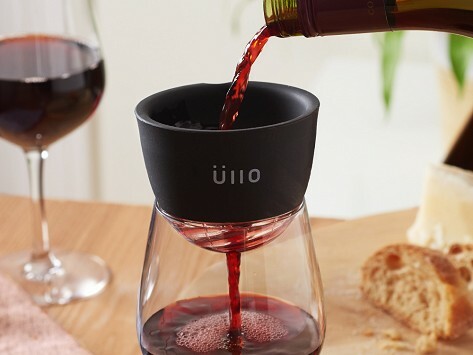 The Üllo wine purifier targets sulfites that can potentially cause unwanted side effects (for you) and alter taste (for your wine). Sulfites work as a preservative to keep wine fresh until the cork is popped. They can cause things like a stuffy nose for some people and even affect a wine’s flavor. Just pour a glass (or bottle) of wine through the sulfite capture filter and enjoy. Wine is now in its purest, preservative-free form. If you’re sipping a red, the filter can serve as an aerator, too. Dimensions: 5.7" x 4.4" x 4.4"
I like the sulfite purifier and I use it often. The only problem I have is the placement of the filter by making sure to place it correctly. When I ordered one for a Christmas gift, I had to order one for myself as well. I am so glad that I did. I absolutely love it. Red wine and no hives! No more stuffed head! We filter a whole bottle and pour it back into the bottle. Easy and so good to know i won’t suffer from a stuffed head. James Kornacki created the Üllo wine purifier for folks like his aunt who experience reactions to the sulfites found in most bottles of wine. Sulfites are used as a preservative to keep wine tasting fresh as it travels from the vineyard to you. Once you open a bottle, the sulfites' job is done. But some people can get a stuffy nose, redness, or headache from them and others feel they impact a wine’s flavor. So James made a sulfite filter that makes wine taste exactly as it was meant to and that eliminates any potential (and unwanted) side effects. He leaned on his background in chemistry to develop Selective Sulfite Capture™ technology. It’s a food-grade porous polymer that attracts sulfites like a magnet as you pour wine through the filter. You’re left with a preservative-free glass of wine that tastes smoother and won’t cause sulfite-related reactions. The filter can also act as an aerator if you’re sipping on red wine.